Posted: Sat Jul 10, 2010 8:28 pm Post subject: Excited. Hi, I'd be in for 2 boards when the new ones are ready to go. Thanks! is this still happening? if so i'll take multiple boards. YESSSS. finally had some spare time and finished a pair of these! so much fun to play with thanks Topp(the 10 mins i had) i am still to add the both mod, and i am unsure how to separate the the gate priority from trigger. will there be another run anytime soon? Yes, please make more of these. I'll take a couple. I'm a bit confused by the phrasing here, as I want to build a 12V version of the board. use either value for both, ie R7,R8 = 1.2K (or 1.5K)? I couldn't find any L7810, I could only get TS7810CZ.. Are these ok? Also, I have HEF4001BP, are these good substitutes for CD4001B? yep, sounds good! the L7810 is just a generic name, LM_ i think is National Semi or whatever. TS i guess is just the mfr.s name. Ok, I've decided to go with this design, since it would look best in my system, I have the panels drilled and ready (image below text).. I have carefully followed all the wiring diagrams in the documentation, but it seems there is a lot missing, so I am now at a brick wall. I do not know what to wire up where, it is really confusing me, hopefully someone could simplify it. Basically there is a PK IN and PK OUT on the panel, but only a PKO on the board. First off I have never heard of PK OUT or PK IN on any other module, what does this mean, what do they do, and why is there no place to wire PK IN on the board? Next, there's a CV1 and CV2 on the board, although the panel only has knobs for CV (presumably for CV1? ), do I wire CV1 from board A to one CV pot on the panel, and CV1 from board B to the other, or do these connect only to one board? Also confused about the 'END' sockets on the panel there is no END point on the PCB to wire these to? Then there's the PI OD wiring points on the PCB, what are these for? And how do I connect the Attack & Decay sockets? a simple 'Go look at the schematic' response will mean these boards will remain in my box with the rest of my unfinished projects until the end of time, as schematics are not my strong point. I can relate better to drawn out wiring diagrams; would someone please be kind enough to draw out a wiring diagram of how it is supposed to be, maybe with an explanation of the above, as that seems to be missing from the documentation. Basically there is a PK IN and PK OUT on the panel, but only a PKO on the board. First off I have never heard of PK OUT or PK IN on any other module, what does this mean, what do they do, and why is there no place to wire PK IN on the board? see above- it is an analog "OR" function- the output "po" will be the maximum value at any of the circuit's 2 [or 3 if you added the xternal peak input] ins..
who's panel design was this? it doesn't really make sense, I would assume it was for a "both" CV input, but then I do not see the jack ? so- no idea. the 281 has 2 CV ins, 1 for att and 1 for dec. the original doesn't have input attenuators for these. the end pulse is available at the "pls" pad on the PCB. I think you must mean PI and PO. PI is peak in and PO is peak out. they would go to the CV1 and CV2 pads. sorry- I didn't do the best job with this and admittedly the nomenclature of the boards is a bit weird.. I hope this helps though and please ask more questions if you have them! 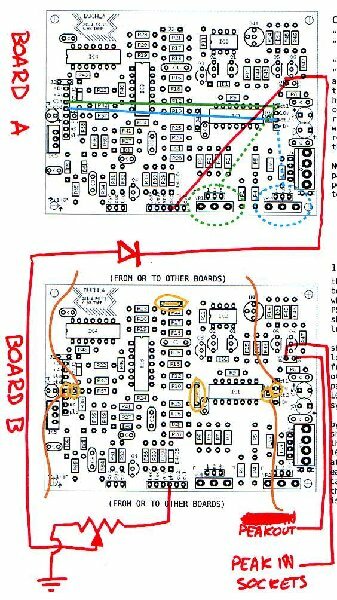 Is it best to wire these from board A or B? Also what is the pad labelled 'PKO' for on the boards if 'PO' is already Peak Out? either, it really doesnt matter which. once you start to look at the pads VS how your panel components are situated, it will probably make more sense to do one or the other. the PKO simply bypasses the 1K output series resistor [that gets wired to your OUT jack] and , following the "A vs B" board" document, u see the way it's used depends on the board configuration . see the bottom left- PKO from "A" board goes straight to "PI", and PKO from "B" board goes to the pot. Has anyone completed this could maybe help me out here? A simple 'yes that works', or 'no it's not right' would be great.. Please can someone help here, there must be at least one person who's completed this. Maybe I should just sell these 4 boards (populated but not wired) and just buy the new versions.. Otherwise they will just sit in my box for the rest of eternity, no good to me there. What's the value as they stand? Hey Lektroid, I can help you out with this, I could do a wiring doc maybe? But unfortunately not tonight, I could try and get something up tomorrow? Thank you! That would be brilliant.. I presume my wiring was not right after all..
Much appreciated, I look forward to it. hi lektroid- sorry for my late reply! i had a look, it looks OK to me- except you'll have to add a series diode inline w the peak in jack. other than that, i think ur good to go..
For example I'm not quite sure what you mean by the series diode, or which direction it goes. Or how I'm going to stuff 2 pieces of wire into the PI pad on the A board without making the hole on the PCB bigger etc. I have some voltage through it, but doesn't seem to be powered properly. For example, I tested the voltage at the voltage regulator on both boards (although only the "A" board has the regulator & 47µF cap in place). On board "A" I get 10V at both outer pins of the regulator, and nothing at the centre pin. Board "B" I only get voltage at one of the outer pins. Board "A" I get around 11V at pin3 of the pots; on board "B", I get nothing on either. I wired the 10V pad on board "A" to the 10V pad of board "B", and also grounded both boards - I would assume this would be enough to power the boards? I still haven't wired the Peak In jack, as I've not had confirmation of what is meant by series diode, or the orientation. I hope someone can help (maybe double check the diagram I posted too)..
PS what sort of Volt reg did you use, 78L10? Hi, I used a 7810 regulator for mine, as suggested in the build docs. The peak wiring is as above, with the cathode of the 4148 splitting off to both PI and PKO on the "A" board (I was not aware there is another way to do this). 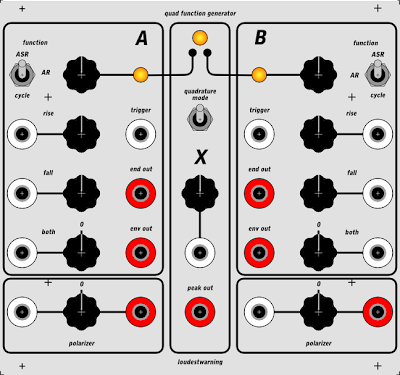 I found a 5U design in the first few pages of this thread, and chose this one (although I did not add the CV pots). Comparison tests sound good.. I wonder, do you have Skype or something similar so we can do them in realtime?